Web development is a desktop thingie. You sit at your desk, sip coffee, and watch Buddy turn your code into beautifully crafted websites while you give an occasional poke to that Vault-Boy bubblehead you got when leaving your first job at the local burger joint. On some occasions, however, you need to take action when you the only thing at hand is your mobile. For example, you’re on your way home and realize you forgot to accept that one merge request required to launch the website live. “Let’s just log in to Buddy and approve it from my phone”, you think. Well, not unless the option you need is in the right column which is missing out from the mobile UI! Or, perhaps, was missing out. We’re happy to say all options from the right column are now available in the hamburger menu at the top. 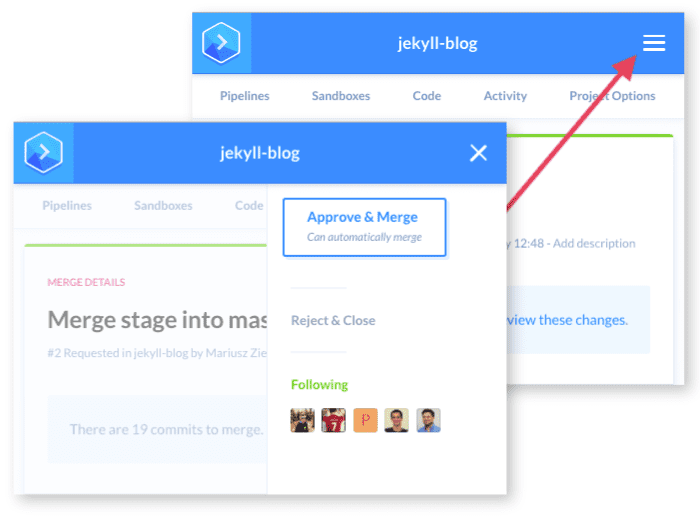 This means you can now add new pipelines, browse commits history, compare changes, merge branches—basically do everything you could do on the desktop.